Organized Jewish practice in Meridian began as a combined effort with the Jews from the neighboring town of Marion. Marion, located about six miles from Meridian, was initially the larger of the two. In the early aspirations of the Marion and Meridian Jewish communities, they hoped to pool their resources and create a temple half way between the two towns. The balance between them shifted when Meridian became a railroad center after the Civil War. As Meridian grew rapidly due to railroad commerce, the prominence of Marion quickly dwindled. Plans to build half way between the two towns were cast aside when Marion’s Jews moved to Meridian. In 1868, this burgeoning Jewish community established Beth Israel as Lauderdale County’s first Jewish congregation. Their first act was to acquire land for a cemetery, which they purchased for $100. 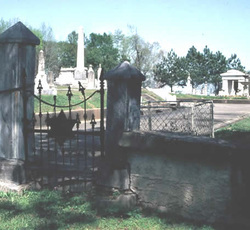 The Beth Israel cemetery, which is still used by the congregation, has been listed on the National Register of Historic Places. The founding of Beth Israel was spearheaded by David Rosenbaum, Alex Lowenstein, Abraham Threefoot, and G.H. Lesser, who served as President, Vice-President, Secretary, and Treasurer, respectively. The fledgling congregation met in several temporary locations in its early years, including a school house on 24th Avenue and Ninth Street, a room up above Carney’s Grocery Store, and Sheehan Hall. By 1873, they had hired Rabbi David Burgheim as their spiritual leader. Initially, only ten families belonged to the congregation, but Beth Israel grew quickly along with Meridian itself. 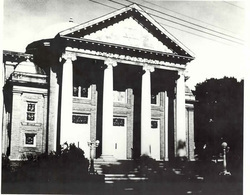 By 1878, Congregation Beth Israel had grown to 50 members, who decided to construct an official house of worship. Their brick synagogue, located on 22nd Avenue, was the first building in the city with gas powered lighting. From its earliest days, Beth Israel had adopted Reform Judaism, and the congregation had joined the Union of American Hebrew Congregations in 1874, four years before they had a permanent home. Rabbi Burgheim was succeeded by Rabbi W. Weinstein, Rabbi Jacobs, and Rabbi Judah Wechsler. None of these early rabbis stayed in Meridian for very long. By 1879, there were 32 children in Beth Israel’s religious school, which shows that that the congregation was largely made up of young families at the time. 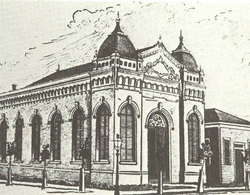 In 1906, the congregation, built a new synagogue on the corner of 11th Street and 24th Avenue. Designed by architect P.J. Krause, this new temple was modeled after the Temple of Athena Nike, one of the major temples of the Acropolis. Leading into the temple were fourteen marble steps, and the entrance was supported by a series of large ionic columns. The synagogue interior, which could seat 500, also mimicked the octagonal shape of early Grecian architecture, and was marked by its graceful simplicity. Interior ornamentation included a large green glass dome, a grand pipe organ, and stained glass windows displaying the Ten Commandments, a menorah, the Shield of David, and the Ark of Noah. The new building suffered a fire in its first year. While it was being repaired, Beth Israel held services at St. Paul’s Episcopal Church, a favor which they were able return later when St. Paul’s was renovating its own building. In 1907, Beth Israel was led by Rabbi Max Raisin and had 82 members. Many of its members were financially successful, and the temple received the significant sum of $4500 in annual dues income. Its Sunday school had 49 students. Reflecting its Classical Reform philosophy, services were mainly conducted in English. In order to advance Jewish life all over Mississippi, in 1907, Congregation Beth Israel hosted a conference for Jewish religious school teachers. The convention hosted distinguished speakers, who tackled such topics as, “The Intellectual and Emotional in Religious Education.” The three day convention was made possible by the efforts of the entire congregation. The approximately forty visiting educators enjoyed the hospitality of the Meridian Jews who opened up their homes to them. 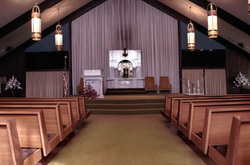 In addition, Congregation Beth Israel offered religious services throughout the conference, and advertised in the Meridian Evening Star that these services were open to the public. As the town of Meridian grew, so too did its Jewish population. The 160 Jews that lived in Meridian in 1878 had swelled to 575 by 1927. Part of this growth was due to the arrival of a wave of Jewish immigrants from Eastern Europe. The members of Beth Israel helped these new immigrants, often sponsoring them and helping them to find jobs and places to live. Beth Israel also created night classes to help these Jewish immigrants to learn English. Beth Israel members also helped to finance business ventures for many of these new arrivals. Many of the new immigrants did not like the Reform worship at Congregation Beth Israel and sought to adhere more closely to traditional Jewish practice. Rather than compromise their religious principles, they formed their own Orthodox congregation, Ohel Jacob, in 1895. The small congregation worshiped in the Pythian Hall and the Odd Fellow’s Hall in its early years. For a long time, the congregation met in the home of Louis Davidson, one of its members. In 1907, Ohel Jacob had 22 members, and only $150 in annual dues income, a far cry from the $4500 a year Beth Israel received from its members. These Orthodox Jews eventually had to adjust their religious practice to the social and economic realities of their new home. In 1907, Ohel Jacob held Saturday morning services from 6 to 8 am, most likely so members could fulfill their religious duties before opening their stores for what was the busiest day of the week. In 1929, Ohel Jacob built a small white frame synagogue as its permanent home at 1300 25th Avenue. They also acquired a small cemetery across from the Beth Israel cemetery. During its later years, members of Ohel Jacob joined Beth Israel and only used the old shul on high holidays. 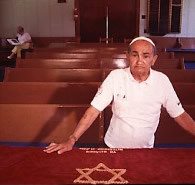 Sammy Davidson worked hard to keep the Orthodox congregation alive, and by the 1980s he was recruiting people to come to Meridian for the high holidays so Ohel Jacob would have a minyan of 10 people. 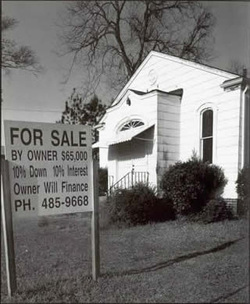 In 1990, the few remaining members decided to disband the congregation and sell the building. The building was ultimately torn down in 2000. Although Meridian had two congregations, by all accounts there was not much tension or conflict between them. Beth Israel members socialized with Ohel Jacob members as social barriers between German Jews and Russian Jews did not exist in Meridian like they did in many larger cities. This undoubtedly made it easier for Ohel Jacob members to join Beth Israel. Indeed, many Meridian Jews belonged to both congregations. While Ohel Jacob never had a full-time rabbi of its own, Beth Israel had eighteen throughout its history. One of the most prominent of these was William Ackerman, who served the congregation from 1924 to 1950. Rabbi Ackerman was extremely involved in civic and interfaith activities in Meridian. In 1926, he was named as the city’s “Most Worthful Citizen” by the Kiwanis Club. His congregation very much supported his civic efforts, taking great pride in how well he mixed into the larger community. The congregation also loved his wife, Paula Ackerman. When Rabbi Ackerman died suddenly in 1950, they asked Paula to fill his shoes as “spiritual leader” of the congregation. Though she had no ordination or formal training, Paula Ackerman led Beth Israel for three years until they were able to find an acceptable rabbi. Paula’s pioneering tenure was twenty years before the first woman was ordained as a rabbi. Though she was always called “spiritual leader” rather than “rabbi,” Paula filled all the roles of a rabbi including leading weekly Shabbat services, giving sermons, and conducting marriages and funerals. In spite of much media attention and criticism from Jews around the country, the congregation remained united under her leadership. The larger Meridian community embraced Paula as they had embraced her husband. Ten years later, she served a similar function at a temple in Pensacola, Florida, where she had grown up. By 1964, the temple was in need of extensive repairs, and the congregation elected to build a new synagogue in the suburbs instead of repairing their 60-year-old downtown building. They purchased a rustic five acre plot located in the residential Broadmoor subdivision. Their new facility, dedicated in December of 1964, was composed of three buildings, all designed by architect Chris Risher, Sr.: a sanctuary that could hold 200 people; a social hall with a kitchen and library, and an education building. They also added a Holocaust Memorial that was commissioned by three local Christians. The memorial stone is shaped like the Ten Commandments and depicts Cain killing Abel; it was designed by congregant Helen P. Shapiro, an artist and Jewish native of Meridian. The close interfaith relationship reflected in the Holocaust monument has deep roots. When Christ Lutheran Church was built in 1869, they fell short financially. The minister had hoped to inscribe the words “Chesed” and “Sholom” on the pulpit to highlight the Old Testament roots of Christianity. Because of limited funding, they were unable to afford it. Members of Beth Israel stepped in and donated the necessary funds. This helped to establish a long tradition of interfaith cooperation. This interfaith spirit was tested during the civil rights era. In 1968, a group of Ku Klux Klan members from Jackson bombed the temple’s education building. Rabbi Milton Schlager had been on the Committee of Conscience’s executive board, which had been outspoken in their opposition to attacks on black churches. Congregation president A. L. Cahn told reporters that the Jewish community would continue to object to the racial violence, stating that, “without unity there is no community.” Local officials and the Meridian newspaper denounced the attack and expressed their support for the Jewish community. A few months later, the Klan group returned to Meridian to bomb the home of Meyer Davidson, and were arrested after a gunfight with police. Members of Beth Israel like to point out that the bombers were from Jackson, not Meridian, and that Jews always enjoyed close relations with their gentile neighbors in Meridian. Congregation Beth Israel has experienced decline along with the Meridian Jewish community. Today, there aren’t enough Jewish children in the congregation to support a Sunday school or youth group. While the temple sisterhood is still active, Beth Israel no longer has a full-time rabbi. Since 2005, Rabbi David Goldstein, the retired rabbi from Touro Synagogue in New Orleans, has come to lead services in Meridian once a month; the community is also served by the ISJL Rabbinic Department. Despite its declining size, Congregation Beth Israel remains active in continuing the legacy of 140 years of Jewish worship in Meridian.